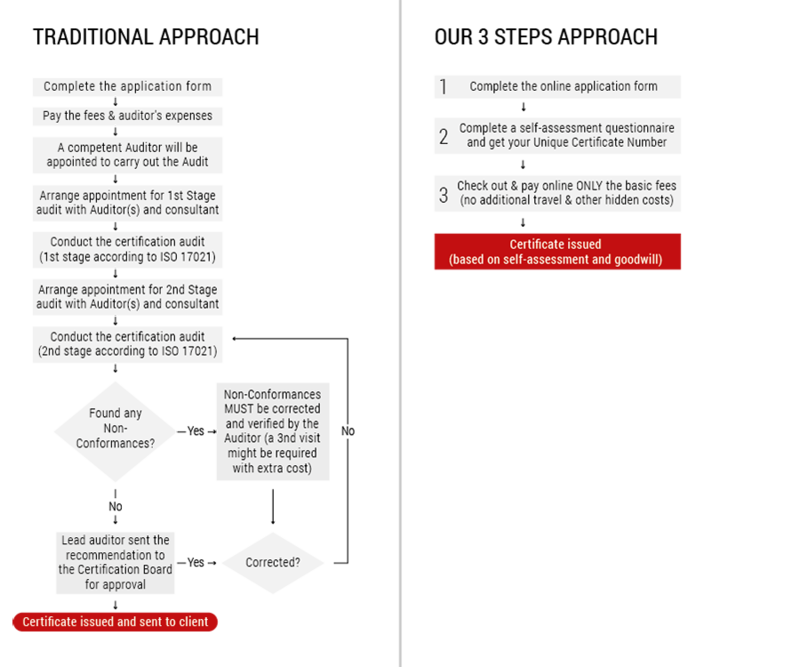 HIBO ISO 9001:2015 Certification - How to get the Certificate. With clients all over the world, HIBO Certifications is the world's leading online certification body in charge of providing information, managing and delivering online ISO certificates. Relying on highly qualified auditors and in-depth technical and legal expertise that are recognized internationally, HIBO Certifications provides you with a comprehensive guide to getting a range of certifications from public standards to more customized schemes, in the fields of Quality, Health, Safety, and Environment. HIBO Certifications offers non accredited certification to a wide range of industry sectors that are contingent on official International Standards and issued upon self-assessment following HIBO’s comprehensive guidelines. This ensures that your certificate is delivered by an organization renowned for its approach, high standards, and service quality. HIBO Certifications professionals are working with clients to ensure that their management systems are effectively maintained and continuously improved in order to meet customers’ growing expectations and legal statutory requirements. Our unique, "simple as 1,2,3" guarantees successful online ISO certification for companies large or small in all business sectors and markets. 1. First create your FREE account, and confirm your registration. Payment information isn't required until a purchase is made. With your registration you automatically gain access to the full scope of our services (guides, walk-throughs, management services, publication and renewal of ISO certificates). Using your account you can easily add more than one company and as many branches as you like. 2. Following the online instructions, answer the self-assessment audit questionnaire and immediately get your audit results and if necessary your corrective action plan. Check out, pay on-line and DOWNLOAD YOUR CERTIFICATE IMMEDIATELLY! 3. 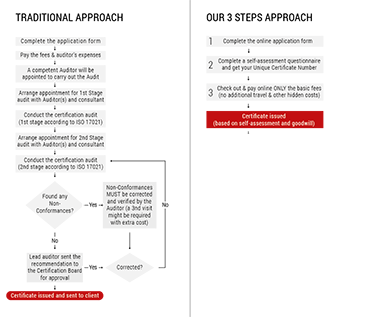 Pay online the EXTREMELY LOW certification cost (using your credit card or PayPal account) and get your Unique Certificate Number (easily verifiable immediately, once you complete the procedure) and DOWNLOAD IMMEDIATELY YOUR COMPANY’S CERTIFICATE in PDF format.